Pretoria Hotels: Mont d'Or Bohemian House Pretoria, Court Classique. Upgrade Option: Add R400 per person and stay at the 5* Castello di Monte or the Sheraton Hotel. Important: This promotion can not be combined with a package or other special offer / promotion and is subject to terms and availability. ﻿Experience Rovos Rail from Pretoria to Cape Town followed by four nights in Cape Town with guided tours of the city, Cape Point and Cape Winelands. Next stop is Victoria Falls with activities including a Zambezi Sundowner Cruise, Cultural Dinner Experience and a guided tour of the falls. Your program ends with a three night stay in Chobe at the Ngoma Safari Lodge. 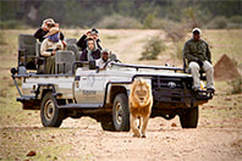 Enjoy big five safari activities both on land and water.